Southwark’s Labour Council has closed all the cash offices, reduced the call centre hours to 9-5 Monday to Friday and is pushing everyone to use their online service. So, last week when my bin collection was missed I thought I would give “MySouthwark” a try to see what sort of service our residents can expect. 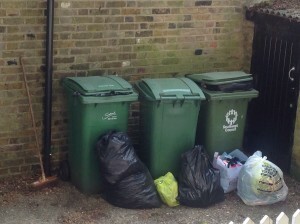 The rubbish for our 5 flats had not been collected on the due day (14th April) so on the following day I reported the missed collection through the website, as an ordinary Southwark resident. At 5.55pm 3 days later I received an email saying that our rubbish would be collected within the next 3 working days. Bear in mind that we have weekly rubbish collections…. The following Tuesday (our normal collection day) came and went, still no collection so that evening I sent an email complaint. The following day (Wednesday) I called the customer services line, explained what had happened and was told they would sort it out. The next day I called the customer services line again and gave up half way through having to explain everything all over again. Today (Friday – 10 days after the first missed collection) I rang directly through to the waste department and was assured that our rubbish will be collected today. 4.30 pm and it is still here. And I still haven’t had an acknowledgement of, or response to my email complaint. What sort of a service is this? UPDATE: Saturday morning, bins have been collected and supervisor has apologised for confusion because they are using a temporary team at the moment. However, I still don’t have a response to my email complaint to customer services….